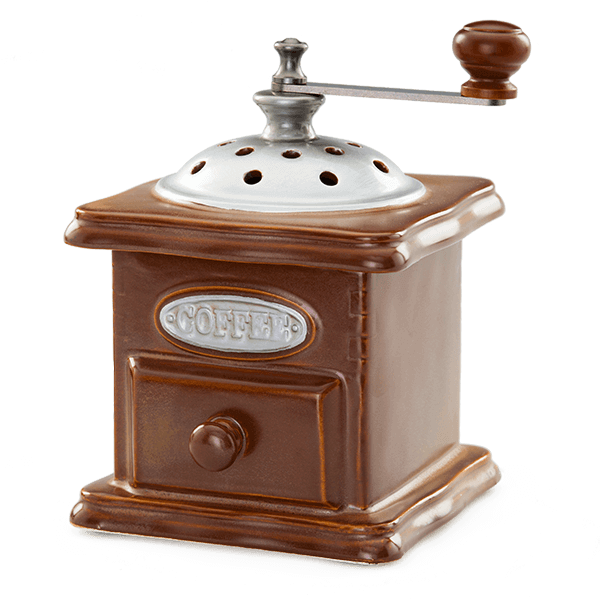 Modeled after an old-fashioned coffee grinder, this warmer embodies the vintage, antique-shop vibe that never goes out of style. •	Scentsy Fragrance Warmers use a low watt bulb to warm wax melts. These wax pieces are placed in the dish or lid, and then releasing their fragrance within minutes, without flame, soot, or other pollutants. •	Wax products- 100% paraffin wax and premium fragrance oils deliver highly scented scent throughout your space. Over 80 Scents to choose from. •	How it heats the wax: Some of our candle warmers use a low watt bulb (15, 20, 25 watts) while others use the candle warmers’ heat dish to warm the wax. These are called Element warmers and don’t give off any light, which is ideal for bedrooms. •	Unique Home décor is important when it comes to our products. While there are other candle warmer companies that sell candle warmers, the quality and design is not the same. At Scentsy, we take pride in delivering a high-quality product, while also keeping up with trends and designs so that your candle warmers fit in with your home décor style. Once you receive your Scentsy warmer, simply add the wax cues in the dish or top of your warmer and flip the switch to on. Within minutes, your space will smell amazing!